I’ve always wanted to make my own granola, and for some reason it alluded me. You can find plenty of store-bought brands that are pretty good, but when I look at the ingredients I usually shudder at the fats used in the process. Certainly nuts are high in fat – good, delicious fat – and I don’t feel like they need any more. In 2004 I lived in Melbourne, Australia for 6 months as an exchange student. I became utterly obsessed with muesli, which is not coated in a syrup and is typically not baked. Another hallmark of muesli is the high ratio of dried fruit and nuts to oats, which I love. My hybrid granola-muesli mix combines the best of both: sweet and crunchy with a generous amount of fruit and nuts. There is no oil, and as a natural sweetener I use high quality Wisconsin maple syrup. I strongly recommend using a high quality syrup in this dish – please take this opportunity to purge your refrigerator of the unfortunate artificial stuff. The puffed millet is another glorious twist in here. You can find it with the cereals in the natural/organic/specialty section of your grocery store. It is a small puffed cereal, similar to puffed rice, but it’s a whole grain and a complete protien. The whole grains and protein are what make this snack amazing – you’ll get a ton of energy as a breakfast or as a mid-day snack. As a person who needs to eat about 5 times a day, this is perfect to carry in my purse. In a small bowl, whisk together the egg whites, maple syrup, salt, cinnamon, and vanilla. In a large bowl, combine all of the parts of your granola – almonds, pecans, millet, oats, raisins, craisins, dates, and cereal squares – toss to combine. Pour the liquid mixture over the oat mixture, and stir well to coat everything. On a silicone lined baking sheet, pour the mixture on to the sheet and spread in an even layer. Bake for 30 minutes. If making a double batch, use 2 sheets and rotate the pans half way through. Allow the mixture to cool completely, and store in an airtight container. 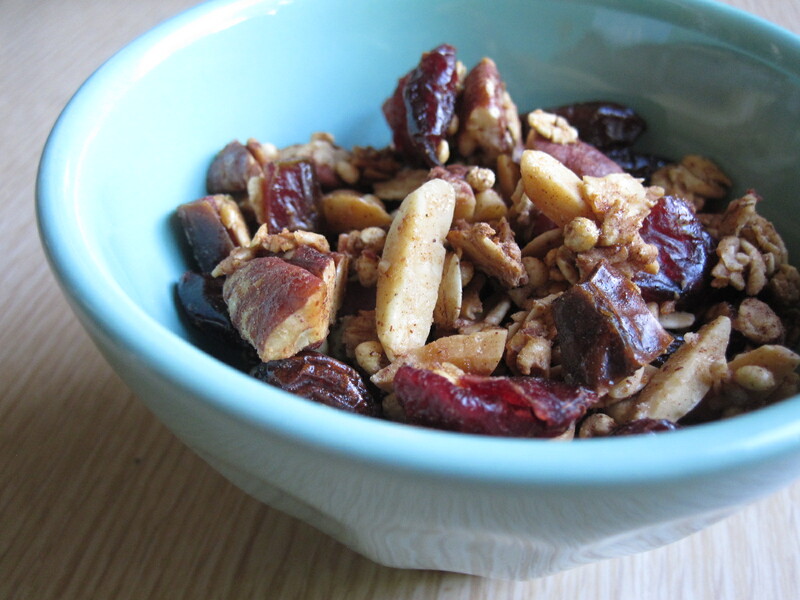 If the granola becomes soggy before it’s gone, re-crisp it by returning it to a 350º oven for 15-ish minutes. It will be as good as fresh.